Master portraiture, get started with gouache and beat stress. 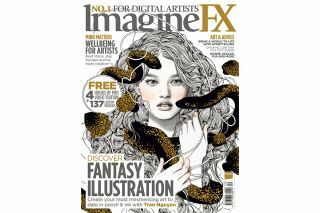 Last month ImagineFX celebrated its 150th issue, but it's showing no signs of slowing down. Issue 151 is on sale now, and it's packed with all the awesome advice, interviews and insights you'd expect from the world's leading digital art magazine. English artist Paul Kidby’s work is synonymous with the world of Terry Pratchett. The ImagineFX team caught up with him to learn how he went from honing his illustration skills under the watchful eye of a mysterious neighbour to hashing out book cover ideas with one of the world’s finest fantasy authors. Aaron Miller’s work has attracted clients such as Magic: The Gather, Star Wars and Dungeons & Dragons. This month, the team chatted to the award-winning artist about the importance of learning traditional techniques, and why classical religious art paved the way for the fantasy genre. Artists have a reputation as free-spirited beings, but look closer and there's a tendency towards perfectionism and the unnatural pressure of being creative to a deadline. Suddenly burnout doesn’t seems like a real risk. This month, the ImagineFX team asked leading artists about their experiences of stress, and for some advice on how they deal with it. If you’re looking to expand your skills (and who isn’t? ), there are plenty of practical tutorials to be found in the pages of the new issue, too. Emily Hare shares the thinking behind her delicate creature illustrations, and explains how to embrace the unpredictability of working in watercolour. Creating an effective environment can be a careful balancing act, but Anna Hollinrake has it down pat. This issue, she shares her worldbuilding tips in an in-depth guide to creating a scene filled with colour and life. And there’s a video to follow, too. If you really want to push yourself, how about turning your hand to a new medium altogether? This issue marks the start of a four-part series exploring how to get going with gouache. Learn all about the gear you need, how to get set up, and the techniques for mixing the colours you need.